Tampa Neck Lift - Traci Temmen M.D. But with the help of Dr. Traci Temmen and her staff at the Plastic Surgery Center of Tampa, you can say good bye to your “turkey neck” and throw away your turtle necks and scarves for good! Dr. Traci Temmen offers the most effective and minimally invasive neck lift procedures available. Dr. Temmen is a board certified cosmetic surgeon in Tampa with a perfectionist nature, elegant surgical skill, and warm bedside manner. At the Plastic Surgery Center of Tampa, Dr. Temmen caters to patients with discerning tastes and high standards in the luxury of her boutique cosmetic surgery office and surgical suite. If you’re finally ready to lose the “turkey neck,” call Dr. Traci Temmen for a free neck lift consultation today. A neck lift is a plastic surgery procedure that resuspends sagging neck muscles, removes and tightens excess neck skin, and defines the angle of the neck and jaw. A neck lift is often performed in combination with a facelift to fully rejuvenate the face and keep the mid and lower face in harmony. Male patients who are unhappy with a saggy neck may often be pleased with the general appearance of their face, and opt only for a neck lift. Patients with a poorly defined neck line due to an abundance of subcutaneous fat but do not have excess neck skin or sagging neck muscles may be a candidate for neck liposuction rather than a surgical neck lift. During liposuction of the neck, small cannulas are used to remove fat that is located above the neck muscles; fat located below the neck muscles cannot be addressed with liposuction of the neck. Those with sagging neck muscles causing vertical neck bands but relatively good skin tone can consider a nonsurgical neck lift. A nonsurgical neck lift is performed by injecting Botox into the muscles of the neck that cause unsightly lines and banding. The effects are visible in approximately five days and cause a softening of vertical neck bands and reduction in the neck skin wrinkles. Dr. Traci Temmen performs every variant of neck lift from the nonsurgical neck lift with Botox, to liposuction of the neck, and finally the standard neck lift procedure depending on patient needs and desires. Patients with loose, sagging skin and neck muscles are candidates for a surgical neck lift. Patients with loss of contours of the neck due to fat but who still have good skin tone are eligible for liposuction of the neck to define the angle of the jaw. Patients with vertical neck bands and skin wrinkles caused by visible muscle edges may be well served by a nonsurgical neck lift with Botox alone. To ensure the safest and best results possible, Dr. Temmen’s neck lift patients must have all medical problems fully addressed and appropriately managed before proceeding with surgery. Patients with uncontrolled high blood pressure, diabetes, or bleeding and/or blood clotting disorders are not a candidate for a neck lift or elective surgery in general. Additionally, to decrease the risk of scarring, skin loss, and wound breakdown, Dr. Traci Temmen insists that patients stop smoking for at least one year before and after any cosmetic neck lift surgery or neck rejuvenation. Because all cosmetic surgery patients are concerned about the scar, Dr. Traci Temmen performs each neck lift through the smallest scar possible that allows safe access to key neck anatomy. Nonsurgical Neck Lift Scar– A nonsurgical neck lift uses Botox, rather than surgery, to soften the wrinkles and vertical banding of the neck. Because there are no incisions, there are no scars from a nonsurgical neck lift! Of course, the results are not permanent or as effective as liposuction of the neck or a true neck lift. Neck Liposuction Scar– Liposuction is performed with the help of long, skinny cannulas placed under the skin to permanently remove unwanted fat. Liposuction of the neck can generally be accomplished with only two or three small, less than half inch scars, hidden on the sides of the neck and under the chin. The scars from liposuction of the neck generally heal well and barely noticeable after one year. Neck Lift Scar– A surgical neck lift scar is placed in front of the ear and extends around the ear lobe and behind the ear to a variable degree, depending on the amount of excess neck skin. Often, an additional one to two inch scar is placed in the skin crease behind the chin to aid in muscle suspension and tightening. Rarely, the chin scar alone can allow adequate access to the neck structures to perform a neck lift surgery. Neck lift scars are similar in location and length to a facelift scar, and usually heal well in the natural skin creases and folds. Dr. Traci Temmen performs her cosmetic neck lift surgeries in an accredited, private surgical suite. Because Dr. Temmen has complete control over the operating room, equipment, and staff, her patients are offered the utmost in privacy, comfort, cleanliness, and safety. A nonsurgical neck lift with Botox can be performed in as little as 10 to 15 minutes and with just a few injections. Patients rarely have bruising or swelling of the neck and are simply advised to avoid rubbing the injected area and strenuous exercise for one day. Liposuction of the neck can occasionally be performed under local anesthesia, but is usually performed under general anesthesia in combination with other procedures. By itself, neck liposuction requires approximately one hour of operative time. Like with all of Dr. Temmen’s liposuction patients, those receiving liposuction of the neck must wear a compression garment and dressings to speed healing, decrease complications, and contour the neck line. Patients recovering from neck liposuction go have the same day and may have a drain that is removed in the first few days following surgery. Patients undergoing a surgical neck lift will have some swelling and bruising that lasts one to two weeks. Dr. Temmen’s neck lift patients usually have drains placed in the surgical site to help speed recovery and decrease postoperative complications. The drains are generally removed in the first few days after surgery. A bulky dressing is worn for several days after surgery, followed by a compression garment for varying lengths of time. Neck lift patients are often able to return to work after one week, drive when they are no longer taking narcotic pain medications, and return to full exercise by six weeks. The cost of neck lift varies by plastic surgeon, region of the country, whether it is combined with another surgery and other factors. Cost should not be the deciding factor when selecting a surgeon to perform your neck lift. The experience and skill of the surgeon is the most important consideration. The average price of neck lift starts around $5,900 including surgeon fees, anesthesia fees, facility fees, and garments. Dr. Temmen offers convenient payment options for neck lift and all other cosmetic surgery. She accepts payment by check, credit card and CareCredit, a credit card that offers special financing and low monthly payments for cosmetic surgery procedures. All surgical procedures carry some risks, and neck lift is no exception. Possible complications include hematoma, seroma, infection, bleeding, bad reactions to anesthesia and unfavorable outcomes. Dr. Temmen will review all of the risks with you during consultation and explain the steps she takes to mitigate these risks. Fortunately, serious complications from neck lift are very rare. 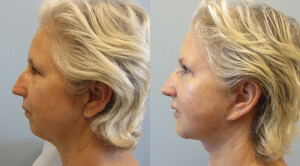 Whether you’re interested in a Neck Lift, Neck Liposuction or Nonsurgical Neck Lift, Dr. Traci Temmen has a wide array of before and after Neck Lift photos in Tampa for you to review. If you don’t see the before and after neck lift photos you’re looking for in the Gallery section of Dr. Temmen’s website, there are many more before and after forehead lift pictures available for viewing during a consultation.